It is a warm afternoon in Florence, Italy. A gentle breeze blows through the large open windows and into the master’s studio. On the table before Michelangelo is a small sculpture just over two feet tall. It is his macchietta, or “maquette”, a finely detailed and expertly crafted three dimensional “sketch”. A miniature sculpt he has created to prepare for a larger work he plans to do. He will present this to the Florence City Council in hopes to gain a commission for the larger, final work he plans to create. Behind him looms a 19 foot block of marble (“and damaged, to boot!” he proclaims) that will eventually become the masterpiece “David”. It will be three years before the figure is complete and it will take forty men five days to move it to the Pallazzo Vecchio. Archways will be torn down and the streets will have to be widened to make way. But the hammering and the chiseling have yet to begin. The final piece has yet to be released from it’s marble tomb. Instead he works on the sketch. The maquette. A small, yet stunning masterpiece unto itself. Arduously, the master works. 500 years later, a talented artist works in studio filled with all manner of astonishing creatures adorning the walls. Headphone wires dangle from his head and run back to an mp3 player resting on a work table in a studio not unlike the master’s. Next to the music device is a sculpture which the artist stares at intently, his head bobbing to the beat of the music. It is a maquette, a pre-production piece that will be scanned into a computer and used as a basis for the costume design of a character in a major motion picture. He will present this to the director and movie producers in hopes to gain approval for the final character design. The movie will be a blockbuster smash and an instant cult classic. The creature will become one of the most recognizable pop icons in film history. But for now, with the sounds of an obscure band beating away through the headphones, the artist works on the sketch. The maquette. The beginning. 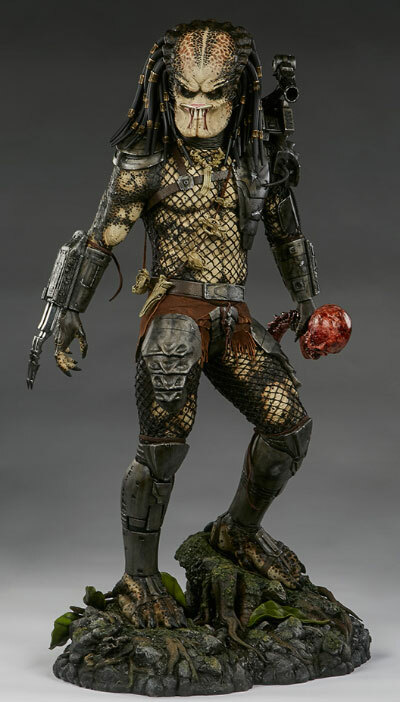 Today, through Sideshow Collectibles, maquettes are offered to the public for sale as limited edition collectors items. Whether as direct copies of the originals or items inspired by maquettes created in the pre-production of some of our favorite movies. These works of art capture the very essence of the creative process while harkening back to the spirit of the great masterworks. They represent the physical manifestations of an idea at it’s conception. Imagine a snapshot of Leonardo painting the Mona Lisa. Or leaning over H.R. Giger’s shoulder as he designs the Alien itself. It is the next best thing to being in the artist’s studio, a moment frozen in time, when a singular vision took form and became a reality. These unique sculptures practically crackle with the fire of creativity, bringing the workshop into your very own home. Yet, they are also much more than that. They are works of art in their own right. Lovingly crafted creations to be admired for their own meticulous beauty and quality. Sideshow Collectibles presents their maquette collection, premium quality items that are a must-have for any collector and true gems in movie history.